«How to. Construct wonderful prose. How to. Induce emotions. How to. Aaron Burch. How to. Does it all. Aaron Burch has done it again. In his latest chapbook, released via PANK, he paints your imagination with images by developing words, phrases, and grammar exactly the way writers everywhere wish they could. How To Take Yourself Apart, How To Make Yourself Anew is something fresh for your tired eyes. The chapbook is divided up into three sections; each cut up into instructions of sorts. Each piece of prose is persistent and non-stop. It makes it hard to put down. While only fifty or so pages, it does not make for a skimmed, quick read. Each sentence, every paragraph is so well developed that you find yourself rereading it. Like a double-take, just to be sure you really did read something so beautiful. Without doubt, you WILL find yourself reading the entire chapbook in one sitting. By my own will, I could not set it aside. By part three, the reader desires to become something else. Something more. Aaron has evoked a new self. Yet, somehow at the same time, he tells a story that the reader pieces together while turning each page. He creates a map in your mind using carefully constructed language. And it is fun to navigate. Draw diagrams of the imagination. Use detail, be intricate; don’t let uncertainty excuse lack of specificity. Once complete, destroy, dismantle, disassemble. Erase, rip, cut, break into pieces. Copy each small piece onto your body—cover hands, feet, arms, legs. A complete transfer, put the whole back together. Tie yourself in knots. Use folds, ripples, waves of yourself crashing into each other. Think of it, of yourself, as a complicated math equation: without one small detail, the formula doesn’t work. The sum adds up to the whole, or nothing. When stuck, lost, confused, frustrated: do as before. Don’t fear repetition. This can be used for other moments; use when needed. Use carbon paper, stencils, mirrors, projectors. Don’t forget the tools available to you. In fact, you may want to make note of these now for later, while you are thinking about them. Writing commits to memory and, when unsure, revert to rote. Try to let it happen naturally. Don’t think about it, don’t think about not thinking about it. It isn’t in your shoulders like you think. The most common misperception. A whole generation, more, all doing it wrong, a mistaken translation. Try to forget everything you know. Everything. This is the first step, though, admittedly, the hardest. Impossible for most. It is in the neck, the small of your back, your triceps. But if you haven’t been able to forget everything, knowing this is pointless. Will only make it worse. If you think about where it is and isn’t—the shoulders, the neck, the back, muscles in your arms you didn’t know you could control—you’ll never get it. But if you get this far. If you get it. Saw, back and forth. Think of your father, out in the garage, handsawing 2×4s into smaller pieces in what seemed an impossibly few number of back and forths. Try to remember what he made, the different things he’d cut himself free from. With one saw in each hand, hold them to your head like antlers; or, reach up to your head and grab your antlers like saw handles. Realize: without both, you aren’t real. A myth, a unicorn. Think of right and left, before and after, old and new. Back and forth. I could just fold you up and put you in my pocket and keep you with me, I said. And I did just that, in half, then half again. I can remember only two facts from growing up: nothing can be folded in half more than eleven times, and swallowed gum stays in your body for seven years. I fold her in half and tuck her in. There, there. "This is the first chapbook I’ve come across, though Wikipedia tells me they were common between sixteenth and nineteenth centuries, are being revitalised in the digital age. I can see their attractiveness, small volumes, literally pocket sized, constrained by limited space to focus and distil the author’s message. They are ideally suited to Flash. Burch achieved publication of this volume (no, too big a word, better "pamphlet") by winning Pank’s first chapbook contest. He already has a number of publishing credits and his editorial skills seem to have been in full use here, paring words and feelings down to the bone. The work splits into three sections: How To Take Yourself Apart: Instructions; How To Fold Paper Cranes: Tales, and How To Make Yourself Anew: A Bestiary. The first is a dissection (the chapbook’s eighteenth century anatomical cover illustration is apt) of memories and awareness, a stripping down and rebuilding. It is also very challenging to read in that way good writing can be, a bouquet made from the author’s intention and reader’s interpretation: each floral arrangement likely to be unique. The second section is more "traditional" a melange of short tales and observations that mix the surreal with the everyday. The final section reverts to a more instructional approach, a kind of magical imbibing of animal attributes. Together, these parts form a whole, a skeleton fleshed with life experiences. «HOW TO TAKE YOURSELF APART, HOW TO MAKE YOURSELF ANEW is subtitled “notes and instructions from/for a father”, and is dedicated to your dad. Would you talk to us about the relationships between this book, you, and fatherhood? - Yeah, sure. I guess, more than anything, father/son relationships are just one of my default themes that I write about, without even thinking about or realizing it. Or at least, I used to not realize it. One of the interesting things about putting together a collection, at least for me, was noticing all these words and phrases and themes that I thought was cleverly sprinkled into a story or two, only to realize I’ve done it a dozen times. After I noticed the fatherhood theme running throughout (actually, more honestly, after someone else pointed it out to me) I figured the chap already had an obnoxiously long title, so why not make it even longer with a subtitle that would then make the whole thing seem more cohesive than I’d intended when writing all the pieces individually. Also, my dad is pretty important in my life and, being a writer, I tend to… you know… not really talk to people or tell anyone anything, and so I thought/hoped it would be a nice gesture for my dad. The ending phrases of nearly every section seem very staccato and curt in their finishes. Is this something conscious in the writing/editing of this book, or is it a (lovely) symptom of your standard writing style? - I think it is probably most of all a symptom of my writing style. The short, staccato ending is probably my short short/prose poem version of the more traditional-length short story’s epiphany, opening everything up to the larger world, character pondering the “useless” and “too distant” stars ending, that writer’s always think is clever and beautiful, but is really kind of overused and samesame. HOW TO TAKE YOURSELF APART, HOW TO MAKE YOURSELF ANEW is like the mixture of a hug and a shove. Would you address this combination of violence and the genuine? - Hm. I’d never thought of it like this, but I like it. I think, again, my default nature is probably to lean toward the hug, and, frankly, I often get kind of tired of and annoyed by my own tendencies to write, and so I try to throw a shove or two in there to mix it up. Usually, when there’s any kind of violence in my stories or short shorts or whatever, it is me trying to throw a kink into whatever I’m writing and then see how I deal with it. I have a kind of imaginary WWBED (What Would Brian Evenson Do?) bracelet that I consult when I start to get bored with my own writing, and that’s when I make a character cut her own hand off, or cut open their scalp, or extract their own teeth, or whatnot. Also, kind of tied to this, I don’t think I’m really a language-driven writer and so these shorts/this collection (and they were all written individually, with no intention of cohesion or collectivity, although they were also all written pretty quickly and during a similar time-span) was especially fun because they were, mostly, me trying to… well… honestly… incorporate the type of writing that I’ve been so interested in lately, people like Evenson, and Peter Markus, and Blake Butler, and Deb Olin Unferth; and I realize now I shouldn’t have even started listing names because of everyone I’m not including. Ah well. I’ll leave it at that. This book places a high emphasis on introspection and digging—the vignettes almost always geared towards tearing something down, breaking something apart. How important do you think it is for writers to re-fold, to re-structure, to cut open and newly digest as they write and edit? 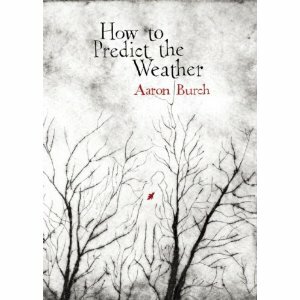 Aaron Burch, How to Predict the Weather, Keyhole Press/Dzanc Books, 2010. 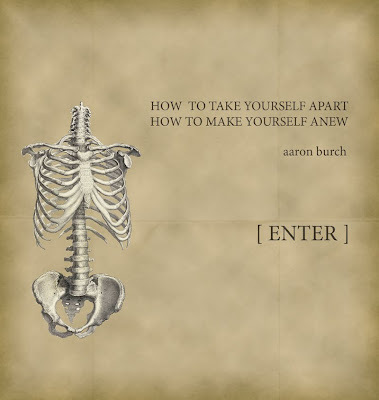 "Ranging from lyrical commands to surreal narratives, Aaron Burch's short fictions swirl with whimsy, meditation, sadness, and hope; blur the line between real and imagined; and focus on loss of lovers, of family members, and even of one's self." "I am not sure exactly what I just read, but I know I was transfixed by each and every word."